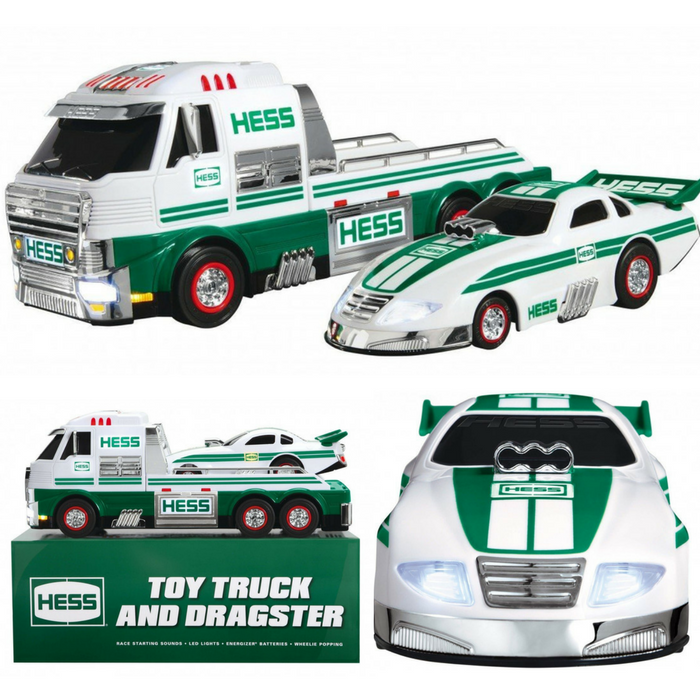 Hess Toy Truck And Dragster Just $35.98! Down From $76! PLUS FREE Shipping! You are here: Home / Great Deals / Amazon Deals / Hess Toy Truck And Dragster Just $35.98! Down From $76! PLUS FREE Shipping! Head over to Amazon to score this Hess Toy Truck And Dragster for just $35.98 down from $75.99 PLUS FREE shipping! 2016 Hess Toy Truck and Dragster The 2016 Hess Toy Truck and Dragster is a powerful, race ready duo with sleek styling, drag racing inspired sounds, over 50 brilliant lights, and an innovative design for wheelie popping action. The Truck is a mighty motorsport flatbed designed to transport the dragster to any racing event. Styled with a solid green lower body and green accented white upper body, it is loaded with chrome detailing including a front grill, sunshield, side panels, and exhaust pipes. The cab houses 4 top mounted buttons that activate 3 realistic sounds (ignition, horn, and an exciting race launch countdown) and the headlights, tail and running lights. A hidden ramp with slide activated hydraulic sound ensures this duo can quickly get to the next dragstrip. The oversized Dragster is the largest accompanying race car in the fleet’s history. Its innovative pull back motor and tilt activated weight transfer design allows the speedster to launch in either a flat or wheelie position. The racer features super bright LED headlights, a stylish spoiler, and chrome detailed hood mounted air intake, side exhaust pipes and rear parachute box.